The toilette is often called a ritual, bringing a religious connotation to the event and subsequently showing the importance of fashion in society. The very act of dressing itself is not just a simple daily task, but an important, ‘religious’ experience, showing the status clothing took in eighteenth century society. Clothing was not merely something to cover the body, but to express position and quality. By ritualizing the activity of dressing, each layer takes on an importance, not simply the outermost layer, showing that fashion was not only what was seen but what was unseen. Furthermore, ritualizing the act of dressing makes fashion a performance. A morning dressing ritual shows the elegance and wealth in each layer, not just the ones that will be seen, an important consideration for a culture obsessed with showing off wealth and power. While the toilette started with the French monarchy, in becoming a ritual for the rest of society, the non-royals could emulate the power and style of the monarchy. A perhaps unintended consequence of turning dressing into a performance is dressing then becomes playing a part. Just as a theater performance is false reality, a woman dressing is emulating a false reality of herself. On the one hand, this performance she is beginning could be an act of submission. As viewers watch her body on display, with each layer she becomes the woman society wants her to be— beautiful, accomplished in the arts, and most importantly a dutiful daughter, wife, and mother. On the other hand, this performance could be an act of rebellion. While society wants to mold the woman into one ideal, with each layer she makes herself into who she wants to be and takes control of herself. 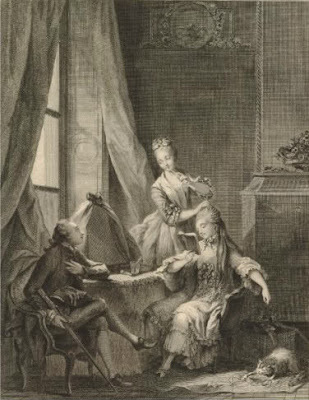 The Petit Dictionnaire de la Cour wrote in 1788 that "a charming woman uses more subtlety and politics in her dressing than there are in all the governments of Europe."